The art of capoeira is one of the highest Brazilian artistic forms. For centuries, capoeira has developed along with the Brazilian people from its most ancient origins: Africa. Slaves were deported from Africa to Brazil and were mainly exploited in sugar cane or coffee plantations. They lived in terrible, inhuman conditions. Tradition states that capoeira was born as a defense technique. 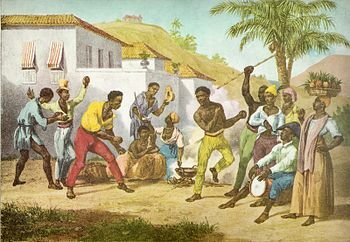 Slaves practiced capoeira secretly and dissimulated it as a dance. Brazil abolished slavery in 1888. Former slaves are now freemen, but they are still emarginated. In these period, capoeira becomes a synonym of crime and vagrancy. With the birth of the Republic, the new government represses capoeira. The law prohibits the practice of capoeira, with penalties from 2 to 6 months of imprisonment. 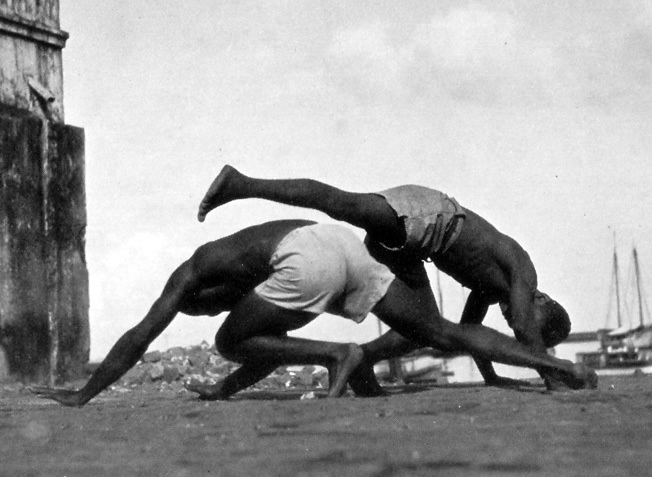 It is only in the 1930s that capoeira recovers. Mestre Pastinha and Mestre Bimba are two key characters for the diffusion of capoeira. 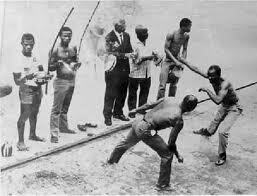 They create two styles of capoeira: Capoeira Angola (Mestre Pastinha) and Capoeira Regional (Mestre Bimba). Frequently, people overemphasize the differences between Capoeira Angola and Regional. Nevertheless, it is important to remember that both styles are part of a unique art called capoeira. The jogo (game) of capoeira follows a specific ritual: the roda (circle). A group of people form a circle. A capoeirista (in general, the master) sings a song and plays the berimbau. All the other participants respond in chorus. Other musical instruments (atabaque, pandeiro, agogo and reco-reco) accompany the berimbau. At a berimbau's sign, two capoeiristas enter the roda. They start the jogo of capoeira according to the rhythm of music and singing. If you watch a roda for the first time, you may think this is only an acrobatic dance. In fact, each capoeirista uses the movement as a trap to dominate the other. Beyond the technique, the capoeirista employs mandinga (malice, cunningness). A capoeirista is astute, quiet and calculating.